Jason Hartman Consulting: Office 365 - Can't Display Online Services - Sorry we had a server issue and can't display your connected services. Please try again. Working with a client running Windows 10 1803 and the latest Office 365 Business software suite with a click-to-run installation. We've just migrated them from a file server to SharePoint so it's critical that they be able to sign in to their Office 365 account inside of the Office suite. This user was having problems signing in when trying to save a Word document. It would prompt for her Office 365 email address but the password screen would never come up. On the Office Account page in Word, it never showed any "Connected Services" where OneDrive or SharePoint would typically show. 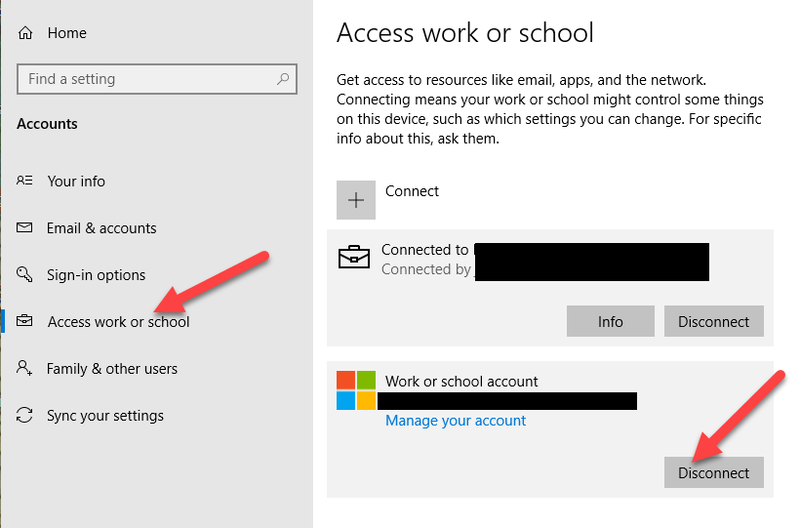 Eventually I went to Settings -> Accounts -> Access Work or School. And I hit "Disconnect" on her company Work or School account. This deletes the saved Office 365 / Azure AD account from the machine. After that, when I went into Word -> Office Account I see the yellow message below. "Can't display online services. Sorry, we had a server issue and can't display your connected services. Please try again." Then she was fine and could open and save to OneDrive and SharePoint with no issues.